Hey SLPs! It's almost the end of the school year! You know what that means? Download this freebie by liking my facebook page! Click on the free downloads button on the top right side (look for the big thumbs up symbol). 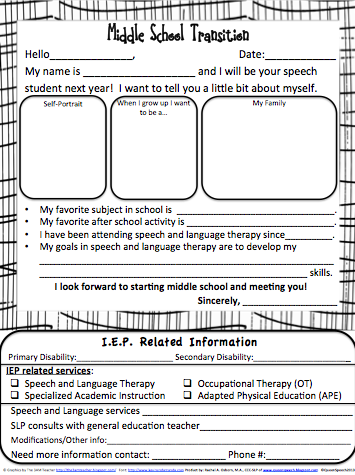 One worksheet: summary for students to fill out and bottom portion for SLPs. 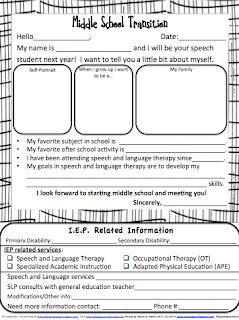 Every year I spend a few hours meeting with the middle school SLP explaining the in and outs of all of my student's IEPs! I decided it would be fun to have the 5th grade students fill out a summary form themselves! This way their new SLP (or teacher) learn about some of their interests, and find out what specific areas of speech/language they are working on. (Do your student's know their own goals? If not check out my SLP Objective Binder). The bottom portion the SLP fills out and includes: IEP specifics such as specific therapy time, what other services are provided, consultation services you provide and modifications/other info.